I'm pretty much a gypsy, but not in the traditional sense of the word. I love to travel and to see new things and when I pack up my things into my back pack, generally you won't catch me in the same place for any more than three days in a row. Next Friday I am off to Ireland to see my family there and this morning, I watched this video about a road trip around the whole country. Now after seeing this video, you can imagine what I would like to do with my three days there. The boys have admitted that it took a little over 4 days to film the video that you can see here, but it looks totally worth it! I know that a lot of my time will be taken up visiting relatives that I haven't seen in at least ten years, as the last time I was out there I was 16. But I would love to get a little road trip in, during my time there. 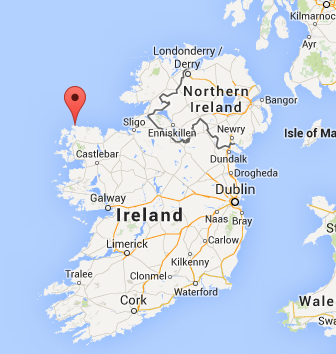 My family live on the remote west coast of Ireland in Portacloy, Mayo. They are all farmers and fishermen, who pretty much live from the land - apart from the odd trip to the supermarket, which is a good 2 hours away from their remote village. I can distinctly remember being asked as a ten year old, if I would like to walk around the corner to see my cousins, as a city girl, I wasn't impressed when nearly 45 minutes later we were still walking. I realise now as an adult, this is something that I will relish the opportunity to do when I go back out there next weekend. The beauty of this part of the country is pretty much untouched too, with no trees around you can see for miles and my family even have the added bonus of the beach being a 2 minute walk from their house.